Comprehensive guide to building your own mobile apps with Ionic, AngularJS, and Cordova. You want to learn how to build feature rich mobile apps? 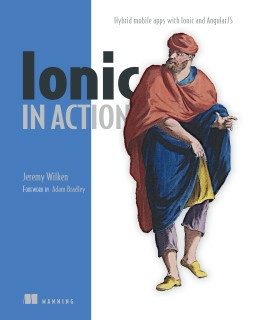 Ionic in Action is the guide you need to learn about the entire stack of tools and technologies used to create production quality mobile apps. Getting your local development environment setup. An AngularJS primer to get you up to speed on Angular concepts fast. How to use Cordova to access the device platform features (such as GPS or camera). Advanced techniques for professional apps. How to leverage external data from RESTful APIs in mobile apps. Testing strategies and tools for Angular and mobile apps. The book is hands-on oriented in providing quality examples that are similar to production quality apps, but also keeping the examples clear and focused on helping you learn. The book is available currently on Manning’s website as a MEAP (Manning Early Access Program) edition. It allows you to get the book today, before it is even available in print. The print edition will be available summer of 2015, and you can also preorder it if you prefer the hard copy. Get the book from Manning. Get the book on eBay. Get the book on Amazon.